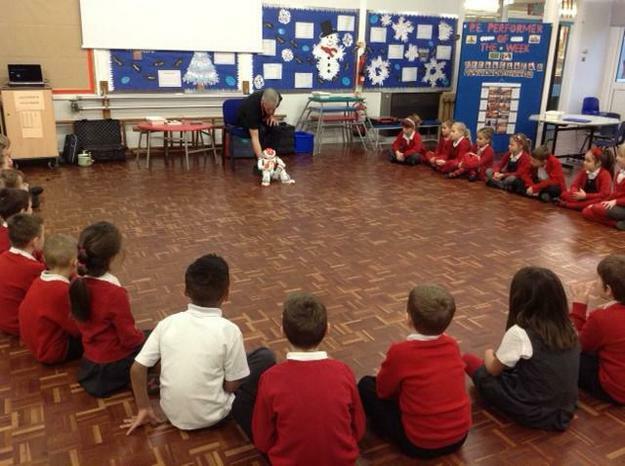 Each class in Year Two have had a special visit from the robot called Nao. Nao gave the children an experience to develop an understanding of what the future may look like. Nao came for a whole day showing the children what he was programmed to do. We were very impressed with all the different things Nao could do and how similar he was to a human. Colin and Sarah explained how Nao worked and gave the children lots of new vocabulary to learn. The children were then shown how they could use the Lego program like Colin and Sarah do with Nao. In the afternoon the children were given the opportunity to show and share their learning with their parent/carer. The children were asked to build a fairground ride with their parent/carer support and we found this was very successful. The children very much enjoyed learning about Nao as well as using the Lego to create their own Robots.